The video version is here. Getting to travel to different nations and compare notes with others in the Kingdom is very insightful. God’s building His Kingdom at macro level and on a personal level. At the top there are large initiatives for prayer, evangelism, city-wide and national events and initiatives that address the core of our society: government, education, entertainment, media, family, business, etc. The highest Kingdom goals are reaching the world and making disciples of nations. God is teaching us to move from revivals that come and go, to reformations that change and bless the nations. Most of us spend our days on a much more personal level – finding the Kingdom of God within us. I want to suggest this area is new and that our success at a high level is greatly enhanced by our own ability to connect with our hearts at a personal level. Traditional leadership is built around identifying a big vision and marshalling the masses to make it happen. The failure point is that that people can be inspired by big visions but they aren’t motivated to endure; they are motivated by their own heart’s desires… especially in the Kingdom! Suggesting they are carnal, rebellious or lack discipline misses their hearts. Leadership styles – In both the corporate world and the church world strong, type-A, High-D leaders have had a first priority to communicate a vision everyone else could implement. In the church world we have described ourselves as obedient servants faithfully carrying out the direction of the Holy Spirit. There has been little value placed on what’s in individual hearts. Leaders who understand God as being primarily interested in obedience to the macro vision are theologically predisposed to be autocratic themselves as they try to represent God before others. It can degenerate to a guilt-based appeal for cooperation, “You should support “my” vision because God wants you to.” It’s really frustrating to have a clear vision and be unable to motivate anyone to follow. The failure point is taking it for granted that anyone should follow. That’s all changing. The best way to carry out a big vision is to a lay a foundation in the leadership and the participants of understanding exactly what God has written in individual hearts, and to make it a priority for them to be themselves. God’s priority is that individual dreams come true along with the macro vision. Good leaders hear God’s heart and the hearts of people with whom they work. They work with heart’s desires instead of against them. In fact, trying to do good works outside the desires of our own hearts is a religious treadmill that doesn’t lead anywhere. It’s the stereo effect of finding that my own heart overlaps God’s desires because He wrote them there. When I tap those desires I’m touching the Kingdom within; it’s already connected to a macro Kingdom strategy that I may not see… which results in corporate and Kingdom progress. Now imagine that you’re that strong leader with a clear vision. What if you had an army of leaders and participants who really shared your vision at a heart level? What if you realized that you really just shared their vision? What if you only led people who resonated with your heart because God wrote the same thing in both? What if leaders encouraged people to be themselves instead of conforming to the corporate or church standard for external behavior and beliefs? Connecting with hearts – As leaders, we’ve only addressed people at an intellectual level. None of us are “led from the head.” 90% of what we say and do comes right out of our hearts. 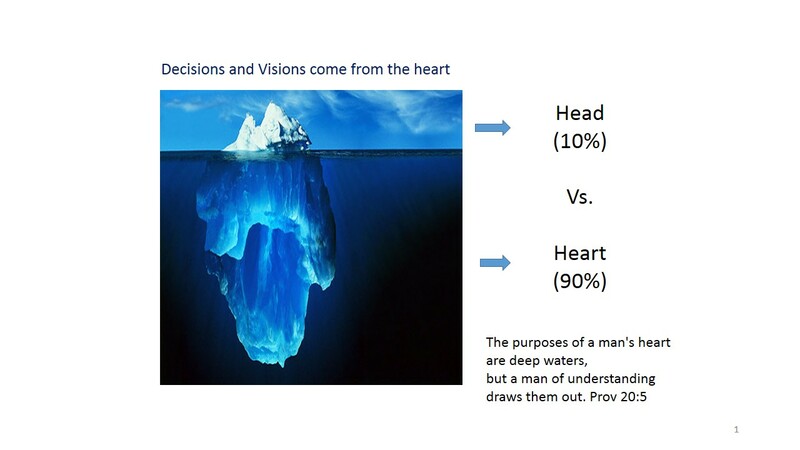 Our leadership paradigm has to start with the heart. We have to listen to hearts instead of words. We don’t have the right to lead people in a direction that is outside their hearts. When we help others connect with the hearts, they will lead themselves to whole new levels of creativity and productivity… exactly what we were hoping for in the first place, a Kingdom dynamic that God is highlighting right now. Learning to connect with our hearts is an amazing journey for all of us. We come from a theological paradigm that places a premium on obedience and service, and we don’t have a practical grasp on how to be God’s friend. We have to give ourselves permission to operate in much greater levels of freedom, authority and responsibility… it does take courage to step into this level of maturity. Servants know how to obey. They are great candidates to have a job and do what they are told, but they never learn to embrace a personal dream, take initiative or create wealth. They view God as a “guidance giver” and themselves as faithful followers who are good at hearing revelation and obeying. They resist their own will as carnal, and have little room for exploring the desires their own hearts. They are left without personal initiative, a major key to the Kingdom. The sad truth is that servants create and attract authoritarian leaders. Friends “relate” to God in a way that makes them comfortable exploring the desires of their own hearts. That’s where they find the will of God. Instead of revelation and obedience, they have a better balance of revelation and wisdom. They are willing to make wise decisions without requiring a special revelation from God or permission from men. The paradox is that they usually get both! Kings can and do put their hearts desires, goals and Kingdom calling in writing. They have a plan. Servants obey with no concept of carrying God’s initiatives in their hearts. Friends own the direction internal to their own hearts. “Obedience” doesn’t describe creativity. Truly creative artists or innovative entrepreneurs are not just following the directions on the package of life. They have something in their own hearts that is producing new and exciting concepts and progress in the Kingdom. They are free to express that level of initiative, and feel the full backing of the Holy Spirit to do it in the sense of working together with God. That “level” of heart engagement is what moves us from poverty to fruitfulness in the Kingdom. What’s next – We’re not devaluing leadership or macro initiatives. We need strong, visionary leaders. We just have to realize that’s not enough. We need to cultivate and work with people who are connected with their own hearts. Our first priority has to be people. God’s people are the currency of His Kingdom. He calls them His glorious inheritance. Jesus was the first born of these “brothers” and he’s promoted them to rule and reign with him. 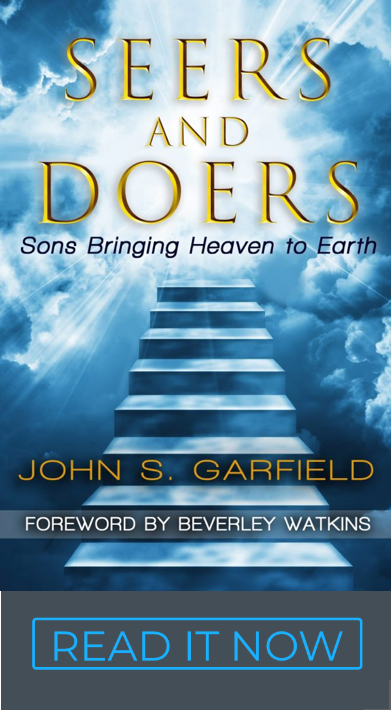 As leaders, we should value their hearts and promote their vision with the same zeal our Father does. It’s loving and apostolic at the same time. The strongest leaders are so confident that they put people ahead of their agenda… and they get both. Where does it start? In the mirror. I have to be in touch with my own heart. None of us can function in the Kingdom from an intellectual belief about what we think God wants us to do. We are all being invited by our Father to become ourselves, function out of the desires of our own heart, and believe that our dreams can come true. Everything else comes across as empty, striving works rooted in a pharisaic version of religion. Around the world in churches and corporations God’s people are choosing life in the Kingdom instead. Join the party. It’s very liberating and it starts when I get in touch with the desires God put in my own heart. Yes, but how? – here are a few resources we use to connect hearts. You can start these things on your own. We’ve found that most people benefit from having someone help us through the heart plan. Call it coaching – I call it a jailbreak. Think about raising the next generation, via Family and Education Mountains, to be in touch with their own hearts (and the Kingdom). Imagine the Kingdom impact on nations. Evangelism of the heart – I’m seeing God’s preparation in the hearts of those currently outside the Kingdom (saved and unsaved). The Holy Spirit is inviting them in. This heart message is really the Gospel of the Kingdom. It has an amazing, compelling, inviting power… the power of God unto salvation. People are hungry for purpose.